Corner Curio Cabinets are space-saving and make a create focal point for any corner area. Fill that unused corner with a handsome case where you may display your collectibles, china, art selections or figurines. Our cases are fully assembled, so just slip in the shelves and you are done. Quality cases made in USA and are fully assembled. In Home Delivery is included within the cont. United States. All cases are illuminated with an easy access switch. Delivery time is only about 2 1/2 weeks or less by an in-home delivery agent. This beautiful corner display cabinet's beveled glass door offers a full picture-frame view of eight levels of display space with seven glass shelves. Finished in Satin Black on select hardwoods and veneers. Pad-Lock cushioned metal shelf clips increase stability and safety. Glass shelves can be adjusted to any level within your cabinet. Adjustable levelers under each corner provide stability on uneven and carpeted floors. Glass mirrored back beautifully showcases your collectibles. No-Reach light switch is conveniently located on the back of the cabinet. 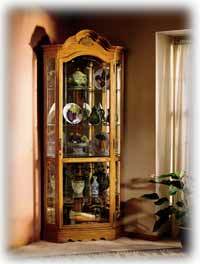 Howard Miller Corner Curio Cabinets offer a great selection of different styles and finishes to highlight any decor. All of the 680 series curio cabinets are made in USA using American grown woods. Adjustable glides keep curio cabinets level.